Based on purchase price of $549 at 0% APR for 18 months. Excludes tax and shipping fees, to be calculated at checkout. Rates range from 0-30% APR. Choose from 6, 12, or 18 monthly payments. 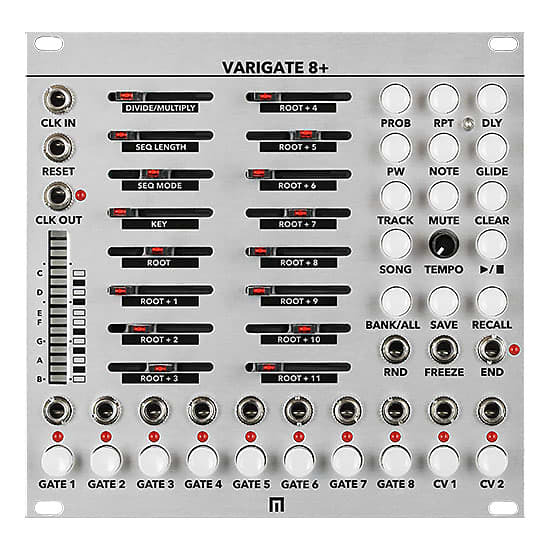 The Malekko VARIGATE 8+ is designed to be the ultimate compact sequencer and control station over an entire Eurorack modular system. Create songs and live performance material with 8 channels of gate outputs with up to 16 steps per channel, 2 independent CV outputs for custom scale quantization, easy recall of 10 storage banks and 100 channel presets, random functions, mute functions and so much more!